Are you a litigator who tries big cases, needs to present a lot of evidence, but still likes to have your trial presentation look like a perfectly choreographed play? If that's you, you will likely enjoy using a trial technician to help coordinate your courtroom technology and trial presentation. The role of a trial technician, sometimes called a hot seater, trial tech, or even trial consultant, is to manage the moment-by-moment display of evidence in a trial. 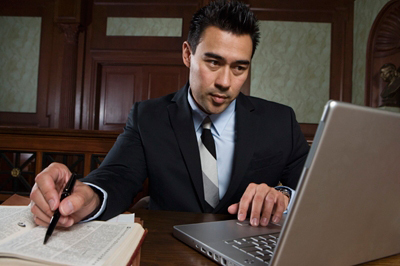 This role can vary considerably, but it usually involves bringing up deposition video that has been synced with the transcript of that deposition, finding a specific trial exhibit, showing judge and jury a particular demonstrative exhibit, and being able to bring up one of thousands or even millions of documents on a moment’s notice. The term hot seater has been aptly applied to this position. Typically the trial tech works with the trial team to help practice the overall trial presentation in a mock trial and in the days or weeks leading up to trial. With the right trial tech, a litigator feels like an expert producer is anticipating their next move and is able to respond to commands almost instantly while not drawing the focus away from the litigator or evidence. We have written about the role of the trial technician before. We have described how challenging this job can be and how to do the hot-seater job well. We have even written an entire e-book on the subject of finding the right trial technician. However we've never really been specific about what a trial technician costs in most cases. As with any professional service, the costs vary considerably. On the low end of the spectrum I have seen trial techs charging about $100 per hour. While on the high end there are a handful who charge more than $400 per hour, although I don't think the cost reflects talent as much as it reflects those particular trial tech’s lack of desire to do what is a very difficult job. The most common rate I see in the industry is about $200 per hour. I'd say 90% of all trial techs are charging within $25 per hour of this amount. However, the hourly rate is hardly the end of the analysis one should perform. Obviously, chemistry, talent, skill and experience should be weighted more heavily than a 10% or even a 50% variance in cost. Generally speaking, you get one bite at the apple in a trial, and the trial tech is a relatively inexpensive insurance policy to make sure that things go well and that you look good as a litigator. After all, the consequences of not having a good trial tech are extremely high. In a recent case our very experienced trial tech sat wide-eyed in court while the opposing counsel's trial tech fumbled in silence for 10 minutes trying to get a presentation going during opening. Needless to say, this left a very poor impression with the jury, and I think this contributed to the eight-figure loss their side experienced. When considering trial techs, the terms are just as important as the hourly rate. Many charge daily minimums, many charge cancellation rates, many charge for equipment rental, many charge for local travel, and there are some who insist on being paid in advance. I think a typical arrangement is similar to what we offer: we charge for out-of-town travel, we ask that the client pay the hotel fees directly whenever possible and we normally charge an eight hour minimum during while at trial. When it fits the situation, we offer a fixed price for the entire engagement and other alternative fee arrangements. The use of a trial technician is a luxury for many. However if the client has the budget, it is a necessity for most. A great trial technician can leave you looking like a star and help you build credibility and trust with the jury. The wrong trial technician can contribute to the loss of your case. This is not a situation in which to be penny wise and pound foolish. Will using a trial technician make me look too slick and high-tech?